Earlier in March this year, China successfully concluded plenary meetings of the Party’s top two bodies, which set the agenda for the year ahead. 2158 delegates of China's top political advisory body, the Chinese People's Political Consultative Conference (CPPCC) gathered in the Great Hall of the People in Beijing from March 9 - 11, 2019. The CPPCC’s responsibilities include supervising the United Front Work Department (UFWD) and overseas work relating to China’s ethnic minorities, enacting regulations and policies for China’s ethnic minorities, interacting with non-communist entities and forging relations with foreign political parties, creating pro-Beijing lobbies abroad etc. The plenary sessions are intended to formalise approval of the 89 million-strong Chinese Communist Party (CCP) to its leadership’s policies, programmes and budget for the coming year. This year the plenums of the CPPCC and China’s version of a parliament, the National People’s Congress (NPC), had as their backdrop the noticeably widening popular dissatisfaction with Xi Jinping and his policies among China’s populace. The unabated restiveness in the Tibet and Xinjiang Autonomous Regions have been causes of serious concern to the Chinese authorities, especially as this year marks the sixtieth anniversary of the XIVth Dalai Lama’s flight from Tibet and of the failed 1959 Tibetan uprising against Chinese occupation. A consequence is the imposition of more stringent security controls in both these autonomous regions. China's approx. 10,000-word White Paper released on March 18, 2019, noted "some of the most notorious terrorist attacks" that have taken place in the world and, in a bid to justify the internment camps that have been set up in Xinjiang where 1.5 million Uyghurs are incarcerated, claimed that it has arrested nearly 13,000 people it describes as terrorists and has broken up hundreds of "terrorist gangs" in Xinjiang since 2014. While neither Tibet nor Xinjiang were reported by the official Chinese official media to have been prominent in the deliberations, but they certainly hung over the plenary sessions. The Tibet Autonomous Region (TAR) witnessed a series of security conferences in Lhasa and the other Administrative Districts in the months leading up to the CPPCC plenary session. These were reinforced with the imposition of sterner measures in Tibetan Buddhist monasteries and on Tibetans. At least one 're-education' camp, akin to those established in the Xinjiang Uyghur Autonomous Region (XUAR), is reported to have been established in the TAR's second largest town of Shigatse and is managed by the People's Armed Police Force (PAPF) now under the PLA. Tibet was declared off-limits to journalists and foreigners for an extended period till April 30 and TAR leaders inspected Tibetan Buddhist monasteries and convened a series of conferences of security cadres to “uncover” and “eliminate” the “double-faced cadres” owing loyalty to the Dalai Lama. Chinese armed police personnel and armoured police cars staged a show of force in Lhasa on March 7. The issue of a White Paper on Tibet on March 27, within days of conclusion of the CPPCC session, suggests it would have been discussed by that body. Politburo Standing Committee (PBSC) member and CPPCC Chairman Wang Yang also visited Xinjiang immediately after the CPPCC plenary. Despite these signs of discontent, the Reports presented to the plenary sessions by Chinese Premier Li Keqiang and CPPCC Chairman Wang Yang bore the firm imprimatur of Chinese President Xi Jinping and affirmed his authority. Li Keqiang and Wang Yang opened their reports with acknowledgments of Xi Jinping’s position as the “core of the Party”. Li Keqiang’s Report contained 15 references to Xi Jinping and not one to Mao Zedong, Deng Xiaoping, or his predecessors. Only Xi Jinping’s political ideology found mention in the reports. Of the 15 and 19 tasks mentioned in the reports to the NPC and CPPCC plenary sessions respectively, the first two listed following “the strong leadership of the Party Central Committee with Xi Jinping at the core” and “Xi Jinping Thought on socialism with Chinese characteristics in the New Era”. As per tradition the CPPCC met first. 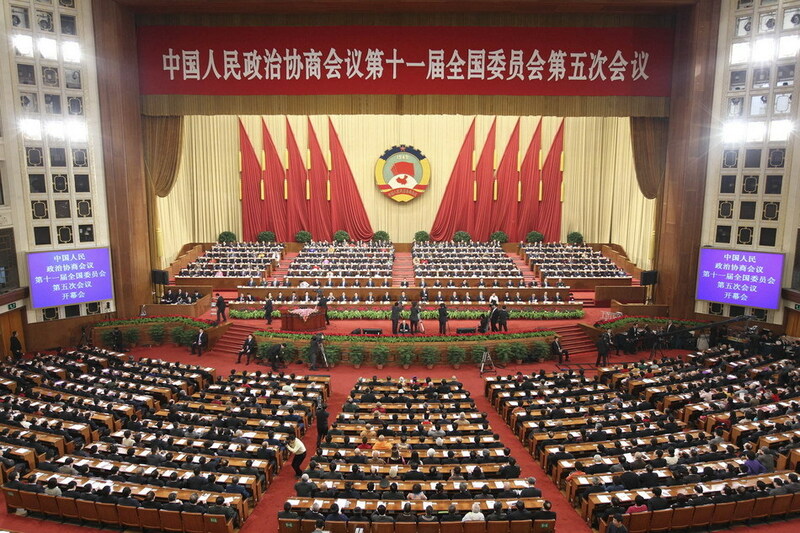 CPPCC Chairman and Politburo Standing Committee (PBSC) member Wang Yang delivered the CPPCC’s annual work report to the 2158 assembled CPPCC delegates on March 4, 2019. Unlike on previous occasions, interestingly on this occasion the CPPCC Chairman’s report acknowledged Chinese President Xi Jinping’s pre-eminent position and said that in 2019, “Top priority will be given to studying and implementing Xi Jinping Thought on Socialism with Chinese Characteristics for a New Era.” He clarified, “The second task is offering high-quality suggestions on the central tasks of the Party and the country.” The body’s four other major tasks for the year are: (i) “Making greater efforts for unity and friendly ties [between the Party and non-Party elements]”; (ii) “Contributing wisdom and strength to major country diplomacy with Chinese characteristics”; (iii) “Making solid progress in the self-improvement of the CPPCC”; and (iv) “Holding celebrations for the 70th anniversary of the CPPCC's founding”. China's authoritative official Xinhua News Agency said that (March 8) during the sessions of the National People’s Congress (NPC) and the Chinese People’s Political Consultative Conference (CPPCC), Chinese President Xi Jinping told the delegates to the two conferences that social science and the works of art and culture relate to the theoretical foundation and propaganda vehicles of the Chinese Communist Party’s ideology. Chinese President Xi Jinping said that social science and art should focus on socialism with “Chinese characteristics.” Xinhua added that Xi Jinping said that without a soul, a country and a nation cannot stand. Works of culture and the arts, philosophy, and social science belong to “the work of casting for souls”. It plays an important role in the new era of developing socialism. Xi Jinping advised that “philosophy and social science research should be based on the great practice of socialism with Chinese characteristics” and should put forward creative and original theories. He emphasized that this year was “the 70th anniversary of the founding of the New China.” It is necessary to present China’s historical achievements and the theoretical and cultural advantages of socialism with “Chinese characteristics”. CPPCC National Committee President Wang Yang and Vice Premier Hu Chunhua attended all the meetings. An important disclosure was made by Wang Jiangping, Vice Minister of Industry and Information Technology, while speaking to CPPCC delegates on March 7. He disclosed that China has a secret program to support the microchip and software industries. His comments were leaked to reporters. Wang Jiangping said, “Last year, the Ministry of Industry and Information Technology planned the “Zhengxin Zhuhun” project under the leadership of the Party Central Committee and the State Council." He added, "The state will give strong policy and funding support, because industries such as microchips and software need to be iteratively developed.” Wang Jiangping also said, “[We] spoke very little to the outside world [about the program].” Wang Jiangping's remarks were soon removed from the Chinese internet. Another interesting disclosure was by Biophysicist Rao Zihe, a CPPCC delegate. He said (March 10) that research and development spending would hit 2.5 per cent of gross domestic product in 2019, citing Beijing’s medium and long-term plan for science and technology development for 2006 to 2020. The CPPCC plenum clearly indicated that China would continue with its current policies of the CCP ‘sinicizing’ Buddhism, Christianity and Islam in China. It affirmed that Beijing would appoint the high-ranking Tibetan Buddhist religious personages, with the White Paper on Tibet (March 27, 2019) emphasising that Beijing had appointed the XVIIth Karmapa as one example. There was no suggestion of ‘negotiations’ or ‘contacts’ with the Dalai Lama and noticeable too, was the absence of direct personal criticism of the 84-year old Dalai Lama. It is apparent that Beijing has decided to ‘appoint’ its ‘own’ Dalai Lama and is waiting out the present Dalai Lama.